Most people think of productivity like Henry Ford said, “Work smarter, not harder.” The word “efficiency” might also come to mind. Yet, that common notion is different from “measured” productivity. Measured productivity, through surveys of employers, comes in several flavors: “labor productivity,” “multifactor productivity,” (MFP) “total factor productivity” (TFP) and dozens (maybe hundreds) of variants. At least since Adam Smith (1723-1790) there has been debate over exactly what “productivity” measures and the ability to measure it. In the 20th Century, a more formal debate was ignited by key studies published in the 1960s. It is wrong to say that measured productivity is misleading, because it is only an equation. At its heart, productivity is just the ratio of outputs divided by inputs. But this ratio quickly becomes a complicated equation in listing numerous inputs and then standardizing (or “holding constant”) the output and inputs. What is wrong? To be misled by a rather squishy equation. In particular, it’s a mistake for central bankers to make monetary policy decisions without understanding the dynamics behind the ratio. In our Fed Dashboard & Fundamentals analyses, we’ve looked at just a small set of the concerns – those related to times series of data that show up nicely in data pictures. Productivity appears lower when inputs fall relative to output – the input that is falling most is physical structures (buildings), followed by land. Read more at, “Read between the lines to solve the productivity mystery.” This is not bad if due to smaller footprint manufacturing or decreasing size of products. Whether “open” offices are good or bad, you be the judge. As much of this is technology-related, what’s important is to refine measures to help us more easily gauge our changing economy. Don’t panic about the measured productivity problem. There are serious concerns related to appropriate education for future jobs, globalization and automation as long term trends, insufficient innovation and growth in real wages and salaries sufficient to pay down debt and grow the real economy. 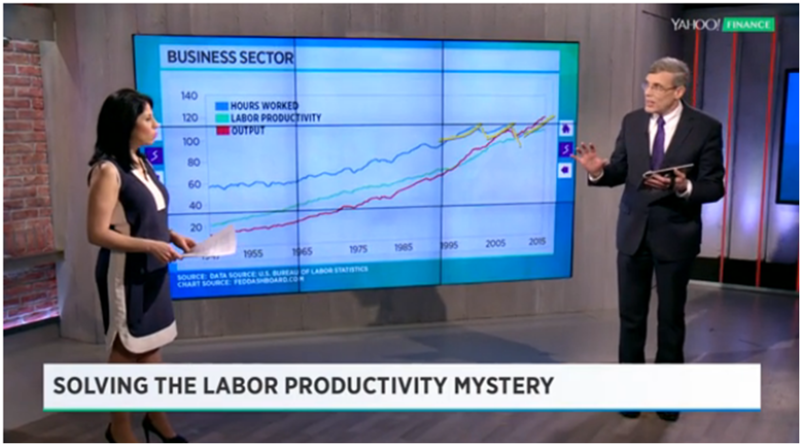 Central bankers should stop using “low productivity” as support for loose monetary problem. This is both because of the measurement issues and because serious concerns can’t be fixed by monetary policy.